I actually made this a while ago, but then the photo got "lost" in my archives and I somehow never got around to posting it. Unlike my organisational system though, this focaccia is truly excellent! Soft and chewy, with a great flavour hit from the grapes and blue cheese. It is gooooooooooooood. Let me repeat that, because you need to believe it: It.Is.GOOD. If you've ever doubted this combo, do yourself a favour and give it a try. You will not look back. And if you phone now... well, since this is not an infomercial you won't get an extra hunk of cheese, but you will get some pretty awesome compliments from whomever gets to taste this. And that's a moneyback guarantee. 1. In a large bowl, mix 1 cup of flour together with the yeast, water, rosemary, garlic, sugar, salt and pepper. Turn out onto a floured surface, and, adding the rest of the flour gradually, knead until smoothForm dough into a ball, grease with olive oil and transfer back into a clean bowl. Cover bowl with clingwrap and allow to rise for 1 - 2 hours. Dough should be double in volume. 2. Meanwhile, pre-heat oven to 220C. Grease a 25cm diameter round pie dish, then pull and stretch the dough to fit snugly into the dish. Make indentations haphazardly all over the surface of the dough with your fingers, then place the grapes into the indentations. Sprinkle with a little bit of salt. 3. 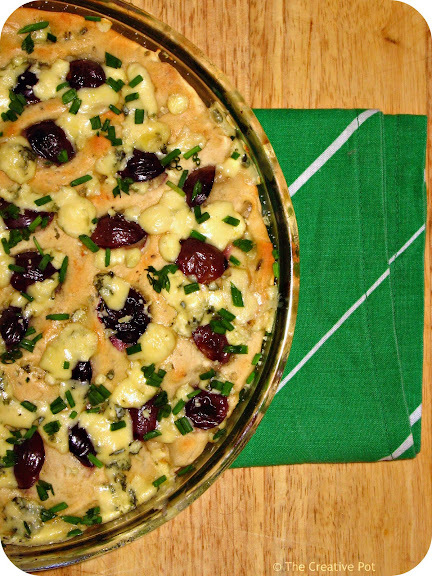 Place focaccia into the oven and bake for 12 minutes, or until it is golden. Sprinkle blue cheese on top, and drizzle lightly with olive oil. Return to the oven for 2 or 3 minutes to melt the cheese. 4. Remove from oven, sprinkle with chives and cut into wedges. Serve while still warm. I have me absolutely drooling with this! Focaccia is basically my favorite kind of bread...amazing. Perfect toppings! Are you trying to make my drool on my keyboard? This looks absolutely delicious, and what a creative mix of ingredients... love the combination of grapes and blue cheese.